Company: Astronotus ocellatus (Oscar) is best kept with other large friendly species. 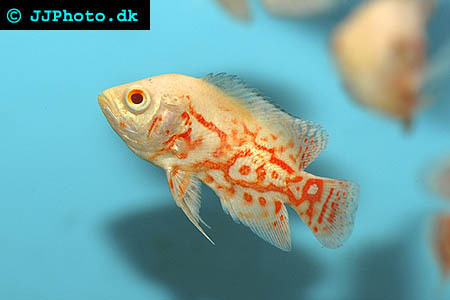 Aquarium setup: Astronotus ocellatus (Oscar) should be kept in a large aquarium decorated with large rocks. Place the rocks directly on the aquarium glass since Oscar fish are good diggers that enjoy digging. Do not keep planted plants with Oscars since they will be dug up. 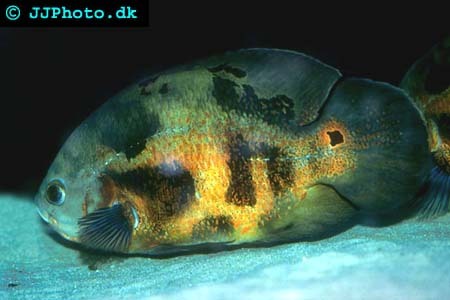 Feeding: Astronotus ocellatus (Oscar) accepts al kind of food as long as it suitable for their size. They love earth worms. Breeding: Astronotus ocellatus (Oscar) lays their eggs on an in advanced cleaned rock. Oscars lays a large amount of eggs and it is therefore necessary to offer them one or several large flat rocks to spawn on. Oscars are usually good parent that take good care of their fry. The larvae are moved to a pit the parents dug once they hatched. Its not uncommon for two female Oscars to breed lay eggs together and even females that are kept alone sometimes lays eggs and guard them. These spawning will however naturally not result in any fry.